Two small boys, a husband and a renovation project: "Drip, drip, drip little ensuite shower"
"Drip, drip, drip little ensuite shower"
I've just had a flick back through my old blogs to establish the facts for this one. I didn't find the answer I was looking for but it was heartening to look back and see the progress we have made in a year - you do forget when you are fed up and tired! Anyway, my original intent was to blog about the shower in our ensuite. It has started leaking! I noticed one of those puddles on the floor that could have come from 101 different places - kids, me, bath etc etc but I knew as soon as I saw it that we had a problem. When Project Manager got back from work, he peeled off strategic bits of cladding in the bathroom and finishing strips in the ensuite. We still couldn't see what was going on so I was sent into the shower to start peeling off the ropier looking sections of sealant and then we swapped so that PM could seal it all up with fresh silicone. 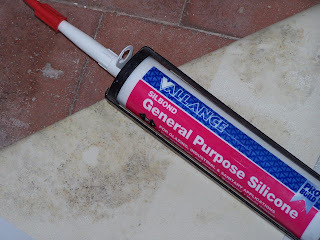 We have, since, spent the last two weeks having a shower in the morning before checking for leaks (which are inevitably there) then coming home from work in the evening to empty yet another tube of silicone into the cracks and crevasses of a fitted shower cubicle. Frustratingly, it has been fine for about 6 months and has only just started leaking. Unfortunately, we are still scratching our heads and it's still leaking! Luckily, the shower is where the kitchen used to be so it's resting on a solid, tiled floor and we don't need to worry about beams or floorboards getting wet!